The reception is always one of the best parts of the wedding day, especially when the dance floors opens up! Big Vancouver Italian weddings like this one often include many folk customs such as the cutting of the groom's tie, the elaborate garter removal and toss, and "La Tarantella"or tarantula dance when guests hold hands, link arms, and dance in circles faster and faster to wish the newly married couple luck. Of course, the mother and son dance is one of the most important and emotional traditions. In this Italian family, the mother and son bond was particularly strong, and the dance at the reception was a way for the groom to honor his mother and show his love. Both mother and son sang to each other as they twirled around the ballroom, and the groom ended the dance by picking up his mother in a gesture that brought the family to tears. The moment was made all the more poignant by the size difference between mother and son. Converting this image to classic black and white was ideal for this timeless memory at this black-tie Italian wedding. When the image is about emotion, not place or color, we love a classic black and white image. Indeed the mixed lighting of this ballroom would only detract from the moment. Reception images of toasts, speeches, and dances like this one are often best in black and white. 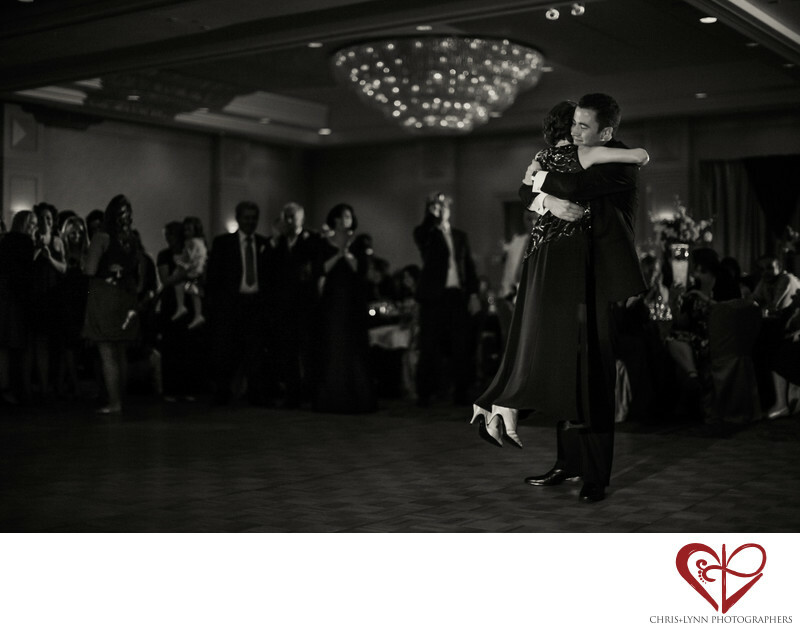 This Vancouver wedding reception photo has been featured many times in publications like Huffington Post, the Knot and others as an example of a heartfelt groom and mother wedding moments. Location: Canada Place, 999 Canada Pl #300, Vancouver, BC V6C 3B5, Canada Pan Pacific Vancouver. 1/125; f/1.2; ISO 800; 50.0 mm.